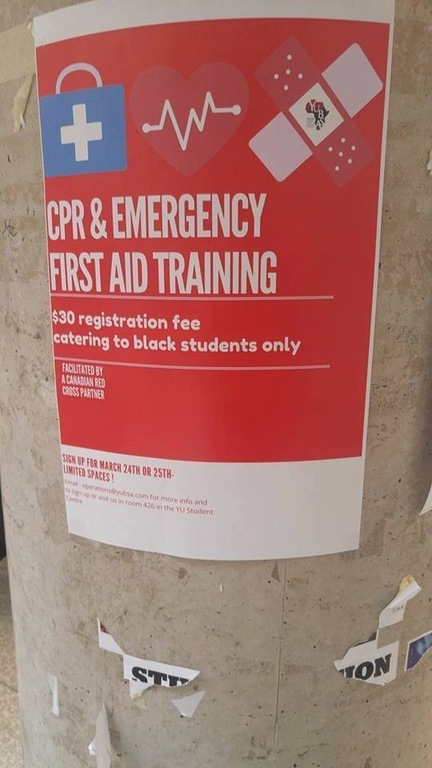 York University’s black student group is offering CPR and first aid training exclusively to black students, defending their discrimination by saying it is part of their “DUTY” to the black community. 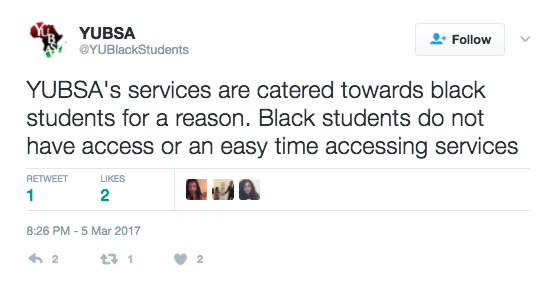 A photo on the group’s Twitter page confirms the event is only for black students. It has come to the attention of the York United Black Student's Alliance that we have anti-black racism in our midst. YUBSA recently began an initiative in which we saw the necessity and usefulness of offering CPR certifications to our community members at a reduced cost. 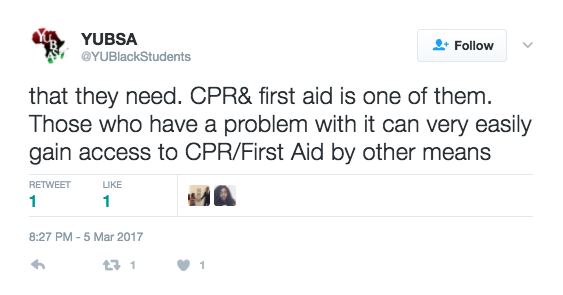 This is because being trained on how to properly perform CPR is an important and pivotal undertaking that anyone should be able to access as they offer practical use in life and give an individual the opportunity to potentially save the life of another community member. In our efforts to offer this to our black community members, our endeavors are met with resistance and anti-black racism. Offering programs such as these to our community members is by no way in any means racist. WE as a community service group we're created in 1996 because of the lack of representation that the black students had at York University historically. York University since it's inception has had a longstanding history of erasure of black bodies, black students, and black space on this campus. Our willingness to carve out space on this campus is an ongoing DUTY of our service group. Our efforts to create more accessible means for our community members to access these programs is a RESPONSIBILITY that we the YUBSA executive have. WE are chosen to represent the interests of the black students at York from an anti-oppressive framework. In the midst of the controversy, the York United Black Students’ Alliance issued another statement (archive link) claiming “whites are not a marginalized group” so they do not need their own spaces on campus. For white folks to claim that they need additional space with whiteness subsumed in the entirety of the Canadian context is idiotic. The idea that some folks believe that white supremacy needs to be perpetuated by carving out even more space for white folks is redundant. 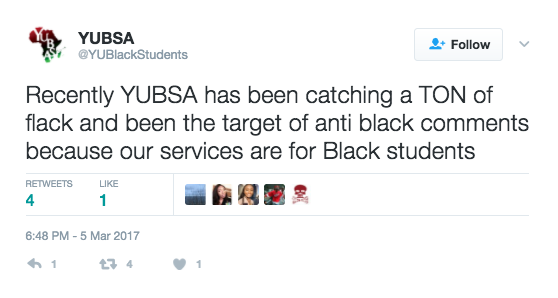 The fact that we as black students who are cognizant of this history of colonization and exploitation are faced with resistance for wanting to provide support for black community members, when other service groups and cultural student groups do this as well, is a testament to the significant anti-blackness that YUBSA and our black community members face every single day. Do better. To the folks who claim they want to file complaints to human rights for prioritizing Black folks in our most recent endeavor. We encourage this. It saves us the trouble of having to collect the receipts of your anti-black racism that York continuously fails to acknowledge is ever present on this campus.